The free trial is the most neglected piece of most early stage B2B SaaS startup’s sales funnels and it is killing their growth. It doesn’t matter how great your content marketing is if you are wasting 85% of the leads that it brings you. And while customer success is a requirement for any SaaS startup, it won’t have much of an impact if your free trial is leaking potential customers. You need to fix your trial. This isn’t complicated, but in practice it gets messed up in all sorts of ways and the further your free trial experience is from that goal, the more it is killing your growth. Just how big of an impact does this have? The graph below shows the story of 3 startups, all starting with $10,000 MRR. They all have great content marketing strategies which is driving 10% month-over-month growth in new free trials. Their revenue churn is 5%, and their average monthly revenue per user is $50. The only difference between these startups is their trial conversion rate. If they don’t fix their free trial, the startup with a 20% conversion rate needs 40% more leads each month just to catch up. That isn’t easy to do. The startup with a 10% conversion rate? They need to grow their leads by nearly 20% month-over-month, just to catch up. What's easier, sustaining that sort of growth in leads, or making a few fixes to how you structure your free trial? Now that you understand how important the trial is, it’s time to find out what you’re doing wrong so you can fix it and get your growth back on track. The reason most free trials don’t work is because they aren’t designed with the right goals in mind, in fact most aren’t even planned at all. Most companies view their free trial as a way for prospective customers to kick the tires and try things out. They may send over a few best practices guide to help them “get started,” oh, and everybody else seems to have a welcome email from the founder, so they probably threw that in too. But that’s where the planning ends. To make your free trial work, you need to identify the user’s desired outcome for the trial, work backwards to find the steps they need to take to achieve that, then design your free trial to actively work to get them to take those steps. Finally, once they achieve that outcome, you ask for the sale (and no, you don’t need to wait for the trial to end to ask them to buy, but more on that later). This isn’t complicated but there needs to be a plan that actively moves them towards their desired outcome, one step at a time. Leaving it to chance because you think your product is so easy to use that the user can figure it out on their own is never going to work. Sure, the most motivated users will figure it out, and many of the early adopters are very motivated, but don’t let that trick you! As you find product/market fit and have to start appealing to a broader market, you are going to get killed. Stop leaving your growth to chance. In marketing you always hear, “Focus on benefits, not features,” and the same logic applies when planning your free trial. People aren’t coming to you because they want yet another SaaS app in their life, they are coming to you because they have a real world problem that needs to be solved. Once you identify that problem and see where your tool fits in, it’s very likely that just using it won’t be enough to solve the problem. While you may be able to get them to try your product, if you want to keep them as a customer, you still need to help them solve it. For an email marketing platform, a user setting up and sending their first campaign could be a good way to measure their functional success (i.e. they are using your product for its intended purpose), but sending emails isn’t the end goal; they want email marketing to help them make more money. They don’t care whether or not it’s your job to teach them these things, if they aren’t getting results they are going to leave. Understand this and incorporate content into the trial to help them truly achieve success. Doing this not only helps the user themselves, but it also starts to position yourself as an authority in the marketplace which has tons of other benefits. A well thought out auto-responder on a fixed schedule is way better than what most startups have for their free trial, but not matter how good it is, it’s still inherently flawed. You might have written down the 12 steps it takes for users to achieve their desired outcome in your trial, but rarely will things flow perfectly from one step to the next with everybody taking the same amount of time at each step. People are going to go at their own pace and follow their own path in your trial. That’s ok because with tools like Drip, there really is no excuse for a modern software company to not be able to send the right email at the right time based on what the user has (or hasn’t) done in the app. Know what step they are on and work to move them to the next one, but accept that it won’t always go the exact way you expected and plan for those variations within your trial. Even if your app is targeted at a tiny niche, there will still be differences among your customers. They won’t all be in exactly the same business, use your product in exactly the same way, or have the same needs. And this is even more true for your trial users. Your trial users all have different problems that need to be solved. There should be a handful of trends that emerge among those problems, but the fact remains they won’t all be there for the same reason. While your average trial conversion rate may be 15% (if it's that low, you need to talk to me), that doesn’t mean every user has a 15% chance of converting. There are going to be segments of users who have a 30% conversion rate as well as those with a 0% conversion rate. You need to anticipate the different needs of your trial users and identify signals that help you group them together based on their actions and likelihood of converting, and then create different messaging to reflect that. Sending your most likely to convert users the same message you send to those with almost no chance of converting means the message won’t be effective for either of them. 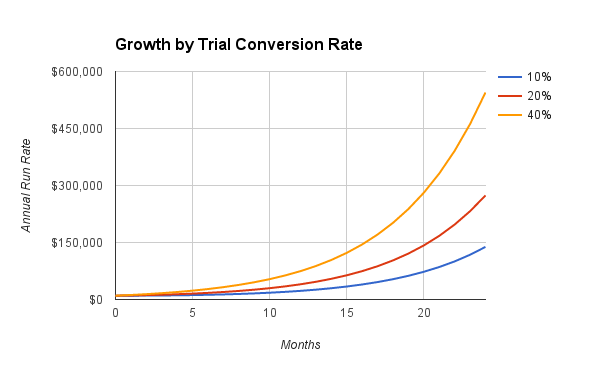 Most founders obsess over finding the optimal trial length that maximizes conversions while minimizing the time it takes to get a paying customer. This is thinking about it wrong. Earlier we said the goal is to quickly get the trial user to the point where becoming a customer is the obvious next step. For some of them, that will be near the end of the trial, but if you setup your trial properly to move them from one action to the next until they achieved their desired outcome, then many will reach that point much earlier in the trial. If the most logical next step is for them to become a paying customer, THEN ASK THEM TO BECOME A PAYING CUSTOMER. It doesn't matter if it is the 4th day of a 30-day trial. Most trials don’t work to quickly get the user to success, but of the minority that do, most of those just keep going once they reach that point. Instead of trying to get them to use every single feature in your product, try to get them to pay you while the success is fresh in their mind. If they don’t buy, it may mean that they have achieved functional success with your product, but not actual success in their business. By asking for the sale early you are able to figure this out and still have time to try to get them there before the trial is over. A win-win for everybody. Lincoln Murphy again comes to the rescue by clarifying that the trial “needs to be long enough for the customer to feel like they’re going to be able to evaluate your service while putting some time-scarcity book-ends on the deal (emphasis mine).” The length of the free trial only matters at a psychological level…if you avoid the common mistake of waiting until the trial is over to ask for the sale. Ask for the sale once they’ve achieved success. Don’t over-complicate it more than that. If you avoid all of these mistakes, your trial is going to be a well oiled machine that helps fuel your growth. Your job now is to get as many people as possible into it, so you need to remove any barriers in place preventing that. I’m looking squarely at you, Mr. Credit Card Required Upfront. Seriously, you need to stop requiring a credit card for your trial. You offer the trial because people don’t trust you and this is a low risk way for them to test the waters. They’ve probably tried a bunch of options before yours and didn’t get results, so they are hesitant that this is yet another waste of time (something that you know is always in short supply). By asking for their credit card, you are telling them that you don’t trust them. Don’t start the relationship by making them jump through hoops, because most will just turn around and leave. People are super defensive about this and come up with all sorts of reasons for requiring it by saying that trial users need some skin in the game or that they want to keep out freeloaders. But freeloaders have credit cards, too! For the prospects who actually are considering using your service (and this is most of them, because people usually have better things to do than play around with B2B SaaS apps for fun), they have to do the mental dance of deciding if they can trust you with their credit card. “Will I remember to cancel in time? Will they charge me early? Do I really even want to do this?” Don’t let them have that conversation with themselves. If you view the trial as a way for people to casually kick the tires and make their own decision about your app, then I can understand this protective mindset. BUT when you’ve designed your trial to actively navigate them step-by-step so they’ll achieve their desired outcome, you want to get as many people in their as possible. What are you trying to accomplish anyways? Hope that they forget to cancel and you get a month or 2 of revenue? That’s not how you build a big SaaS company. When you know your trial does its job, then it’s time to open the floodgates. Requiring a credit card upfront lowers the number of people who sign up. Stop doing that. These mistakes may not seem that big, and a few of them are so common that you’d think they were actually best practices, but they all add up to act like a weight on your growth. If you’re converting less than 30% of your free trial users into paying customers, you absolutely need to re-evaluate your free trial process because right now you’re throwing money away. Luckily, fixing this doesn’t have to be complicated. You don’t need to get everything perfect, but if you can just follow these rules, then you’re growth will quickly improve. Wouldn’t it be nice to know your trial is doing its job so that you can focus on the other 1,000 fires that need to be put out every day while running a startup? I’ve shared a ton of tips here that will easily improve your free trial conversion rate and accelerate your growth, but words alone don’t bring results. You need to take action. When pressed, most founders already know that their free trial isn’t getting the attention it deserves not because it isn’t important, but because it’s impossible to find the time when you are balancing customer support, new feature requests, sales, and everything else that goes along with running an early stage startup. You don’t have time to get your hands dirty with the trial. My Trial Teardown service does exactly that, saving you hours upon hours of time you don’t have by doing all that work and giving you a step-by-step plan you can hand to your team to execute, knowing the result will be a free trial experience that accelerates your growth instead of slowing it down.